Grace World Mission: Merry Christmas 2007! 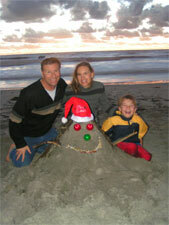 No snow on the Southern California coast so “Sandy the Sandman” will have to sit in for Frosty. Check out our audio message on the Holy Spirit in Christmas by clicking here. The true spirit of Christmas is the Holy Spirit. He came upon Mary in power, causing the virgin to give birth to the Savior of the World. He makes the impossible, possible, causing even a virgin to birth a child, the Savior of the world, no less. He also filled Elizabeth and her husband Zechariah as they prophesied about the birth and ministries of the Savior and their own son, John the Baptist. The Holy Spirit also led Simeon to the temple to meet the newborn King of Kings at His circumcision and to prophesy over Him. This is the same Holy Spirit who lives in us who have believed upon that same Savior Jesus Christ, and who desires to fill us with His power (Eph. 5:17), to lead us (Rom. 8:14), and to guide us in our lives (Gal. 5:16) by His Power. If you want to get into the true Spirit of Christmas this season, call on the Savior and ask to be filled with the glorious power of the Holy Spirit. He brings peace even into the messy mangers of our lives and will renew your hope and joy as you call on Him and receive His power. The Holy Spirit led us up to Santa Barbara for a huge swell and even huger divine appointment where 3 people were impacted by the Kingdom of God. Bryan getting a few nice ones at the rarely ridden break known as "El Capitan" in Santa Barbara. The Holy Spirit led us into a very powerful divine appointment just recently. Like on many other occasions, the Lord used the vehicle of surfing as a bridge to reach out with the Gospel to a few lost souls in a very effective way. After doing lots of ministry recently, I had been feeling led by the Holy Spirit to go up North a little ways to Santa Barbara to celebrate our birthdays. Then, an unusual e-mail came in from a friend who doesn’t even surf, telling us about an upcoming massive swell that would be hitting Santa Barbara just right on the week we were thinking of going there. We ventured up to Santa Barbara into one of the largest swells to hit California in recent memory. Spots that haven’t had waves in ages were woken up with enormous swell pouring through. Catching some rare waves at a historic point break that hasn’t broken in maybe a lifetime, called “El Capitan,” was a definitely unusual experience. It however doesn’t compare to what the Lord did when we stayed at a small motel in the area. While checking out of the motel Mercedes began to talk to the desk clerk about the incredible waves going on in the area that were being shown on the news and newspapers. The clerk was a surfer himself who, it turned out was also a backslidden Christian who had at one time been preparing to go into ministry. We shared with him about the grace of God and his need to turn back to the Lord and be restored. We prayed with him to repent and rededicate himself to the Lord. As we layed hands on him he was also powerfully impacted and filled with the Holy Spirit, and furthermore, was healed of a painful area in his chest that had been injured recently while falling as he was drinking. He had fallen onto a beer bottle that had damaged his chest, breathing, and arm movement, but the power and mercy of God completely healed him when we prayed. He was quite astonished and overcome by the mercy of God. While we were praying for him, one of the maids from the hotel wandered in the room where we were. She told us that she wanted to receive whatever he was receiving too and wondered if she could be prayed for too. Even mentioning that she was willing to pay for whatever he was getting! We talked with her next and shared with her the need to receive Christ and be born again before we prayed for her, and furthermore that is was a gift of grace from God and free. She received the Lord and was born again and was also touched and filled by the Holy Spirit with tears in her eyes as we prayed for her. Then the same thing happened again with another maid who came in when we were praying over the first maid. This other maid also wanted prayer, so we shared the Lord with her and she also received Christ and was born again and touched and filled with the Holy Spirit. What an incredible divine appointment with three people being ambushed by the Kingdom of God! One rededicating his life and being filled and healed and the two others receiving the Lord and being touched and filled by the Holy Spirit. All of it happening right on my (Bryan’s) birthday which was a pretty awesome kingdom day. We spent two extra hours at the motel after checkout, staying into the afternoon praying and witnessing to God’s awesomeness, yet still caught some more of that epic swell that day at another mysto Santa Barbara break. Newsletter continues on next page with info on our ministry work during the last Summer and Fall, please click here. Your donations are always appreciated.